This personal tactical folder designed for Boker Plus by martial arts instructor Jim Wagner may be just what you need if you carry a knife for urban emergencies like cutting yourself out of a safety harness or smashing an occasional car window. Although the Reality-Based Plain Blade serves well enough for that, if you use a knife for standard purposes, the special design of the blade might seem awkward. 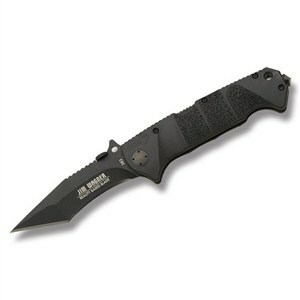 With a stout, piercing point that Boker describes a a gladius-style, the blade plunges through tough materials easily. A concave cutting edge on the anodized high carbon stainless steel blade hooks straps and cord for quick cutting, but won't be quite so easy to use if your applications involve paring and slicing. Whether a knife makes good sense for everyday carrying depends on how well it matches your daily chores, and if you're an electrician or a handyman, you might miss the old drop point. For the urban survivalist more interested in clambering out of car wrecks than in peeling apples, this design does make good sense. Deep finger grooves in the fiber reinforced nylon grip give the knife excellent grip strength in difficult circumstances, and the wide handle provides torque for the strong 3-7/8-inch blade. The knife blade swings out with a push on the thumb stud, and locks securely into open position for a working length of 9 inches. Underneath the nylon handle scales, you'll find a strong framework of stainless steel. The pommel includes a hardened steel insert useful for smashing window glass. See the Boker Hyper for a slimmer pocket folder designed by Chad Los Banos.